The image is a little bit of a spoiler but it seems a likely candidate to appear in the next trailer, due around September. ThorinOakenshield.net has a calendar in hand and posted the image first after placing an order. This will be in the hands of other consumers shortly or is already. 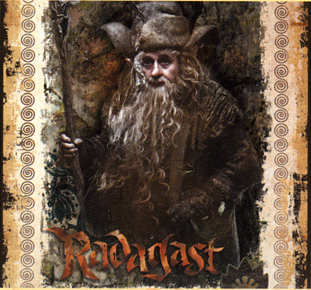 Radagast is visible after just after the break so once you click, you are spoiled. There will be no missing him. 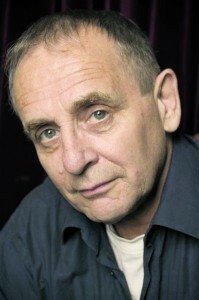 The first hints of Radagast to the public came in a barely glimpsed and blurred out image in a December production diary. But that is clearly not the same thing as this official image. The next Radagast sighting was from CinemaCon in unfinished footage from Peter Jackson, via Warners Bros. It was projected at 48 frames per second to distributors. Our own Quickbeam wrote the definitive account that included details about the wizard and his sled of bunnies. But this image of the wizard is the first to actually be definitive about what the wizard will look like. He gets a mention from Beorn the shape changer when his is speaking about wizards to Gandalf. He lives in Middle-earth at Rhosgobel, his home on the edge of Mirkwood. He is known to have a fondness for animals and is disparaged by Saruman for this. But really, just read our character summary here from our own Hobbit movie FAQ.